Election officials in Virginia are counting provisional ballots, and the results could change which political party controls the state's House of Delegates. The House is split, with 51 Republicans and 49 Democrats. Just one district turning blue would create a 50/50 split, with Lt. Gov.-elect Justin Fairfax, a Democrat, holding the tie-breaking vote. Three House of Delegates races in the state are too close to call, including in the 28th District, which includes parts of Stafford County and Fredericksburg. Republican Bob Thomas leads Democrat Joshua Cole by just 84 votes. 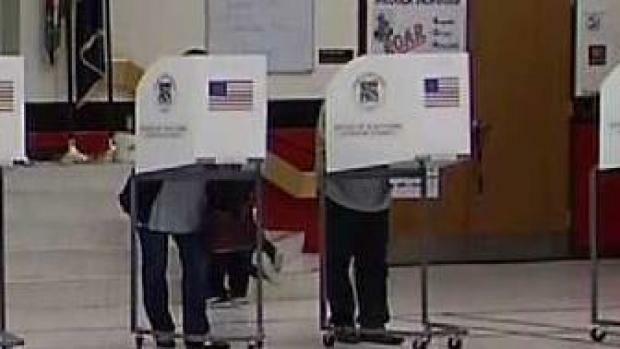 News4's Justin Finch is in Fairfax County, where votes for the House of Delegates will be counted today. Voters in that county could swing the Virginia House of Delegates toward a Democrat majority, or solidify Republican control. 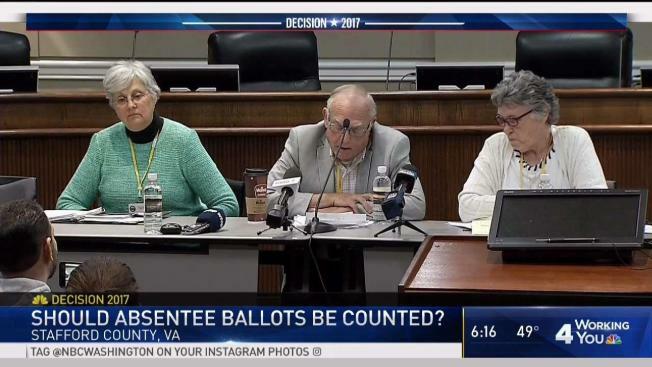 The Stafford County Electoral Board voted in a closed session Monday to seek a legal opinion on whether it can count 55 absentee ballots -- some from military service members -- that were found the morning after the election at a post office just down the street from the board's office. "The court will make the final decision as to whether these 55 ballots will be counted," electoral board chair Doug Filler said. In addition to the 55 absentee ballots, there’s an unknown number of provisional ballots. Provisional ballots often are cast because a voter failed to bring proper identification to the polls. They are counted after other votes. Also, some claim another 1,100 absentee ballots are not being counted. Protesters chanted and held signs in Stafford County Monday morning, concerned that some votes would not be counted. Thomas' campaign said in a statement: "The Thomas campaign is firmly committed to fair, open and honest elections -- based upon the laws of the Commonwealth. \We believe that every vote that was legally cast should be counted under the provisions prescribed within the Code of Virginia." Cole told News4, "We have to make sure there is fairness and equality across the board, and that's really what we are concerned about -- to make sure everybody has an opportunity for their voice to be heard." The Virginia House Democratic Caucus is concerned that voters "may have been improperly disenfranchised." “We continue to monitor the canvass in Stafford County very closely and remain concerned that military and overseas voters may have been improperly disenfranchised in violation of the U.S Constitution and federal and state law," they said in a statement. "We will watch carefully what the board does [Tuesday] and will assess our options at that time. But make no mistake, we will do everything we can to ensure that every eligible voter has his or her vote counted." Voters had the chance to defend their ballots to county officials. They initially had to do so by Monday at noon. On Monday afternoon, the Stafford County electoral board gave provisional ballot voters one more day to defend their ballots. Fifty people who voted this way were notified they could follow up to try to make their vote count. In District 40, which covers parts of Fairfax County and Prince William County, Democrats claimed a victory before officials uncovered that a voting machine error gave Donte Tanner an extra 100 votes. Long-time Republican incumbent Tim Hugo now has the lead. On Monday, Fairfax County accepted 16 provisional ballots for this race. Tanner gained 12 votes and Hugo gained 4. Those results do not include the District 40 precincts that fall into Prince William County. Overall, the Fairfax County Electoral Board accepted 360 provisional ballots on Monday, out of 686 that were cast. Once electoral boards determine which ballots should be accepted, the final votes will be calculated. Then, the votes will be reviewed by a state office and certified. The results could be released as early as Monday, officials said.